Take US 31 to the Monroe Rd. exit. Go W. on Monroe Rd. to Lowell St. Go W. about 5 blocks to Park Entrance. 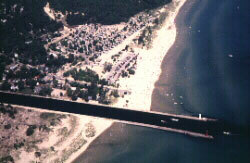 Charles Mears State Park is located in the quaint village of Pentwater along the Lake Michigan shoreline. Paved campsite lots are surrounded by fine sand, and a swimming beach is adjacent to the harbor pier. The existing park land was once owned by Charles Mears, an early settler of Pentwater. The land was donated to the State of Michigan in 1923 by Carrie Mears, the daughter of Charles Mears. The park is located just outside the resort village of Pentwater, which offers many unique activities for park visitors. The park hosts a fireworks display on July 3rd and a kids bike parade on July 4th. The Saturday after July 4th holiday is the start of the Pentwater Arts and Crafts Fair. The second Thursday of August marks the start of a four day Homecoming Festival that features a sand sculpturing contest on Park Beach and a fireworks display from a pier adjacent to the beach. The last weekend in September is Fall Fest, an annual art fair. There are boat launches and marinas in Pentwater. Charter fishing is also available at some of the local marinas. For more information on local area events visit the Pentwater Chamber of Commerce. Beach House - Provides clothes-changing area for swimmers. Located next to the concession building. Fishing - Shore fishing is very popular at Pentwater Lake in the fall, and anglers can expect to catch steelhead, perch, trout and smelt. Fishing from piers adjacent to the park is also a popular year-round activity. During the winter, Pentwater Lake provides excellent ice fishing. Picnic Area - Picnic tables and fire pits/grills. Picnic tables, grills and fire circles are available at the picnic areas. Parking is available for 250 vehicles. Hiking - There is an interpretive trail about one mile in length that winds around to the top of Old Baldy, a wooded and sand-blown dune that provides an excellent view of the Lake Michigan shoreline, the town of Pentwater and the boat harbor. Snowmobile Area - Allowed with 4" of snow or more on the ground. Snowmobiles are not allowed on the hiking or cross-country trails, but the activity is supported in the park. Concession/Store - Located in the day-use areas of the park. Lighthouse - The Pentwater Pier is a popular attraction near the park. Sandy Beach - A beautiful sandy beach with a beach volleyball court, horseshoe pits, grills, and picnic tables. Wireless Internet Access - MiWiFi provides wireless Internet access in the day-use area of this park. The access point is located near the concessions area and radiates about 150 feet from this location in all directions. 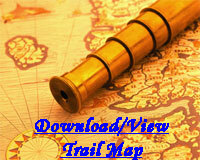 This service is also available in other parks and harbors throughout Michigan.